Fabulously Floridian: Get the look, for less! Get the look, for less! One of my simple pleasures has to be when I dress up for work after a long, tiring morning of classes. Recently, I’ve been joking at the fact that I feel Miley after she transforms to Hannah Montana when I change out of my school clothes and get all dolled up for work! 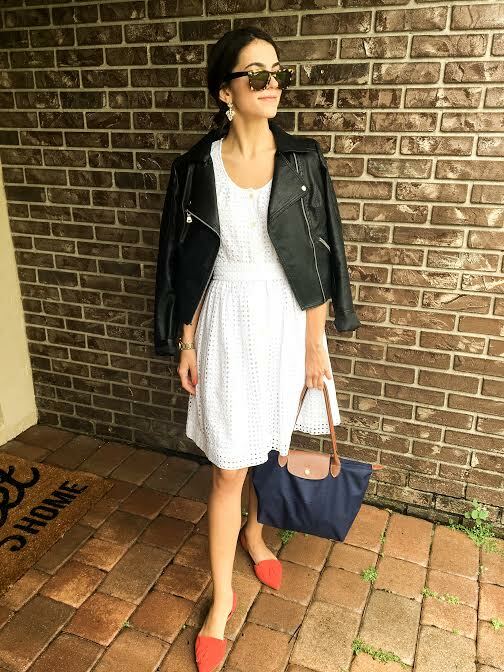 The other day I was inspired by one of my favorite bloggers, Julia from Gal Meets Glam, at how she dressed up one of her white dresses by throwing on a motorcycle jacket to create an easy summer-fall transition outfit. Before I saw this inspiration, I was actually considering selling my white eyelet dress until I realized all the possibilities this dress has! I added my own personal touch to Julia’s look, staying true to myself and my personal style. I received so many compliments on my outfit that day and the best part is the whole outfit head to toe is completely affordable! Keep reading to find out how! I scored this dress from Kate spade last year for a grand total of $30! Below I'll link where you can find each piece to create this look! This outfit was perfect, especially living in South Florida, where it's always so hot and difficult to dress for the fall weather! I love your dress! The detailing is so pretty.